What is the best rooftop cargo carriers out there you say? Rooftop carriers are essential items for any road travel whether you are going for a road trip or moving out of the city. Finding the right one that suits your needs can be sometimes monotonous and time consuming. With so much out there in the market, it’s almost impossible to find the right one. There are so many features, each one of them having different designs, and different materials. How do you distinguish from features that are unnecessary, to features that are absolutely useful? Which one last for your needs and which one don’t. Rooftop carriers are mainly used for that extra storage when traveling, giving you that spacious luxury inside your own vehicle. But of course, it is absolutely necessary that everything stays dry inside during the pouring rain. You might spend a fortune on a cargo carrier that you may not really need, or under spend for another one that doesn’t get the job done and you end up with a wet cargo. That's why we have compiled for you the top picks for the best rooftop cargo carriers out there in 2019. Do You Need Padding Below When Using a Soft Type Cargo Carrier? If You Don’t Have No Roof Rack. Soft vs Hard Which is Better? Rightline gear 100S30 boasts a 100% waterproof rooftop carrier. 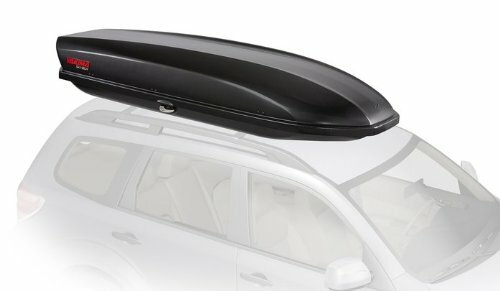 Like most soft rooftop carriers, this one can be attached to the roof of your carrier with or without the roof rack. Simply use the straps to attach it to your roof rack or use car clips in order to attach it through the door frame, if you don't have a roof rack. 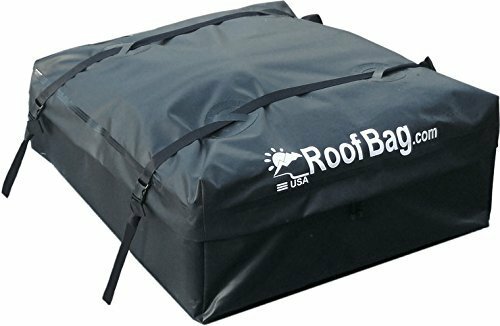 This rooftop cargo is made with UV protection that allows it to be exposed under the summer heat without breaking or damage. It is made from semi coated Mesh XT and a Hydrotuff material for maximum strength and durability. Besides, it features an aerodynamic design that reduces drag for the better driving experience. The material on the carrier itself is welded along every stitching, in order to produce a waterproof seam. The carriers ZipRight System is made with zippers that are urethane coated with an added layer of zipper flaps to cover the zipper seam and insure maximum waterproof quality. The flap is folded down over the zipper and can be secured in place using a hook and loop closure, making sure it does not flap around in the wind during a heavy rain. Otherwise, water might be forced into the seam. The most common problems people face when it comes to soft rooftop carriers is that they tend to flop around during high speed driving. To ensure that this rooftop carrier does not do that, make sure to fill this up to full capacity or at least 80% at minimum. Fewer than that and this will flap around like crazy. In strong winds you may also use a pool noodle placed inside and at the bottom to give it a more rigid shape. It is big enough to store two- or three people's worth of camping gear. The aerodynamics of this cargo carrier is pretty average so long as it stays put on top of your vehicle. You will need to stop from time to time to make sure that everything is properly tightened, otherwise, this just might flap around like crazy when faced with strong winds which is pretty normal when it comes to these types of soft rooftop cargo carriers. Also, note that water may leak into the vehicle through the straps if you rigged it through the door frame of your car that does not have a roof rack. The product itself is indeed sturdy enough, but you would probably be better off using better straps. It produces a fair amount of noise during driving. Make sure the ends of the straps are properly tightened. Also, make sure to loop or tape any extra straps to lessen those annoying noise. This is designed to fit any and all types of vehicles and can be attached on all four sides. For what it offers, this is a pretty decent cargo carrier and gets the job done. But don’t assume this to be a permanent solution. Just as all soft type rooftop bags, these things will break after a few uses. So, keep that in mind. The design looks just like a regular box. The straps are a little thin. 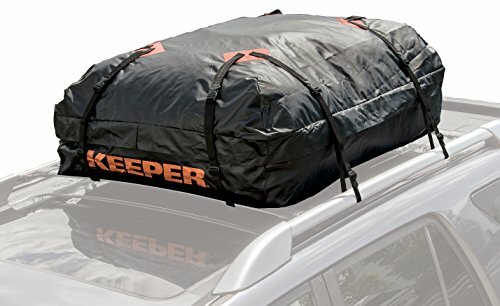 The keeper rooftop cargo is designed to fit on all types of vehicle. This carrier can be attached on all four sides. The product is made with laminated nylon that claims to withstand any and all types of environment like rain, sun, wind and grit. Designed for the adventure seekers and travelers at heart who loves to move around a lot. This heavy-duty construction design protects the cargo carrier from any type of exposure. The soft-sided design will allow you to store odd-shaped items inside without affecting passenger comfort. Another great feature of this rooftop carrier is that when you don't want to use it, you may simply fold it down to size for minimal storage. Allowing you to prop it up anytime when you need it. This product is sturdy enough, but you will still need to adjust the straps from time to time to ensure that it does not flap around. But you will only need to do this for the first couple of times until its fully secured. As far as the noise is a concern, this cargo carrier is a little less annoying than the previous product, however you can still tone down the loud annoying noise by wrapping or taping the ends of the straps. Of course, you can always play the radio to drown the noise. But with this cargo carrier, you won’t really notice the noise that much. The aerodynamics of this cargo carrier is a better than the average soft type cargo carrier. That is probably because of its soft-sided design, which might just save you some well-earned gas mileage compared to other cargo carriers out there. Just make sure to secure it tightly. As far as security is concerned the zipper pulls are a little small with tiny little locks. I do not advice leaving this cargo carrier on your car for the night if you ever plan to check in on a hotel. But I think that applies to all types of soft type cargo carriers anyway. Driving for days in the pouring rain, this carrier holds up pretty well and keeps everything inside dry which is always the main quality of using a cargo carrier in the first place. One problem you might encounter if you use this without a roof rack and try to strap it into the vehicle through the door frame while driving in the rain is that, water will definitely creep its way through the straps and into your car. So be prepared with a bucket or two. Installation is easy or hard? Installation is pretty easy. Make sure you follow the instructions properly. The straps are pretty sturdy. Extreme environments may affect the straps like any other soft type cargo carriers out there. But this one holds up pretty well. The bag is well made and well designed. As any type of soft cargo carrier, this is not a permanent solution. When it does wear out, we think it's good enough to get another one, for another adventure. This rooftop cargo carrier is fairly easy to install in any vehicle whether you have a roof rack or not. Made by the company’s very own triple seal technology that claims 100% waterproof experience. With seatbelt-style straps that goes up to 3000 lbs. strong. Just like most Cargo Carriers, it comes with only one color, black. So, you're stuck with that. Not too many options for colors in the rooftop cargo carrier market. The aerodynamic shape of this cargo carrier is pretty average as most soft type cargo carriers on the market today. As far as fuel efficiency is concerned, it is pretty average as well. As far as the noise level is the concern, It is surprisingly a little less noisy than most soft type cargo carriers, you may still hear it if you try to focus on listening to the noise. This is due to its heavy material fabric. It is made from leather when viewed from a distance, but it is not. The abrasion resistant vinyl that is double coated material, helps protect the cargo carrier from ripping or peeling. This specially formulated material fabric is made to withstand extreme conditions like rain, sand, snow, and continuous sun exposure. It can hold a lot of stuff and is fairly durable for quite the long journey and keeps your cargo dry as well as safe from debris, especially against heavy rain. During cleaning, we recommend that you clean it while it's still full, before emptying the contents. It makes the cleaning process a lot easier that way. Since this product is waterproof anyway, there's nothing to worry about. The straps are very simple to set up and adjust when needed. Extreme temperatures may cause the straps to shrink or expand, make sure to keep an eye, and adjust when needed. This is normal when it comes to dealing with extreme environments. Of Course, if you use it without a roof rack and choose to strap it through the vehicle while driving in the pouring rain, then it will certainly invite water into your vehicle. Be prepared with a bucket or two, unless if you want a swimming pool inside your car. As far as your cargo inside is concerned, it will still keep your cargo fairly dry. Since it is made with high quality thick materials. Whom do we recommend this? However, do note that the buckles are made of hard plastic. Make sure to strap around or tape the end of the straps, or you may also twist them and fill in the gaps for a minimum noise. The design is a bit similar with the Rightline Gear 100S30 having a more squarish design. You may place a pool noodle or any hard foam on the bottom to give it a more rigid structure. The product is well made, which makes it an inexpensive and great alternative compared to the hard-shell cargo carriers out there if ever you're not the type who travels a lot. Great for the average traveler. Of course, this list would never be complete without amazons very own product. Introducing the Amazon Basics Rooftop Cargo Carrier made by well, of course, Amazon themselves! This Cargo Carrier has a compact design, while also increasing your vehicles carrying capacity well up to 15 cubic feet. Amazons very own cargo carrier boasts a durable design with waterproof qualities as you would expect with these kinds of carriers, otherwise, no one would buy them in the first place. The Cargo carrier also has its own fade resistant feature that is great under the summer heat. Though it won’t keep your luggage cool, it will simply keep the cargo carrier safe against fading due to the heat. 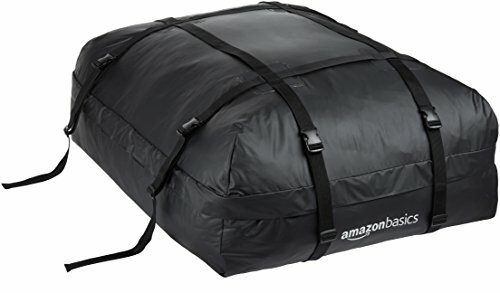 This cargo bag has an oversized zipper with flaps that wrap over the zipper seam for added protection against the rain. The flaps are held down in place by Velcro strips to lock it in place and prevent it from flying upwards during high-speed driving or windy weathers. The flaps hold everything well in place. Amazon really took it over the top with its eight-strap design and buckles. Making sure this cargo carrier stays on your car's rooftop and stays there for good. The straps are good at keeping the entire cargo bag stable. The buckles are made with good quality hard plastic which is the same material that goes with the zipper. But keep in mind and make sure that you tape and tie down all the loose straps to avoid those annoying flapping noise. The sheer number of straps on this thing can make one hell of a racket during strong winds or high-speed driving. You may need to put your radio on maximum volume just to drown the noise, or you may try taping and tightening each ends straps in place. Not even your ear radio on maximum volume can tune the noise out. But you can always tune down the noise by taping and tightening each end straps. 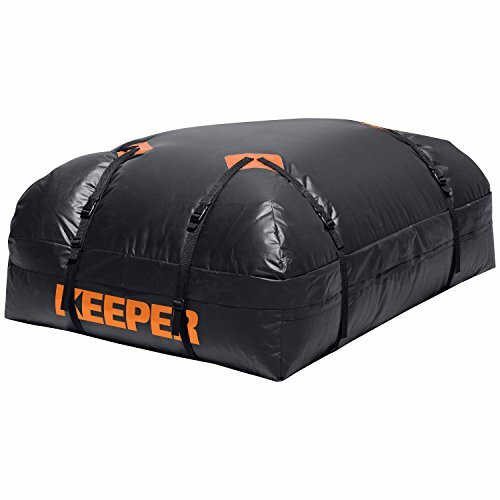 The aerodynamics is a little similar to the Keeper Rooftop Cargo Carrier with its soft edges. We would expect that it will perform the same. The eight-strap design is very solid but can somewhat feel cumbersome to install and adjust. May take you at least 30 minutes to install this thing, maybe more if you’re a little short or find this a little heavy. The heavy-duty zippers do its job of keeping everything in place, keeping out rain water and still worked smoothly. Though I wouldn’t bet on security, due to the fact that just like any soft cargo carrier out there with enough force, they can pop this open or cut the material fabric itself. Overall, the cargo did its job against dust and water. However, it is a little damp against crazy rainstorm. The bottom layer is a bit thin and probably needed a bit more padding. The design is clean but installation can take some time to set up with it having 8 straps total, which is a good thing to keep it in place on top of your vehicle. The large amazon logo might make you feel like you’re running an ad campaign for Amazon or that people might think that you’re an employee. The material is like one of those vinyl shower curtains on your bathroom. The upside is that it is a cost-efficient way for traveling. We would consider this as a good one-time choice, and once it becomes no longer usable, getting another one should be without some degree of cautious optimism. Now let's move on to the hard case cargo carriers. 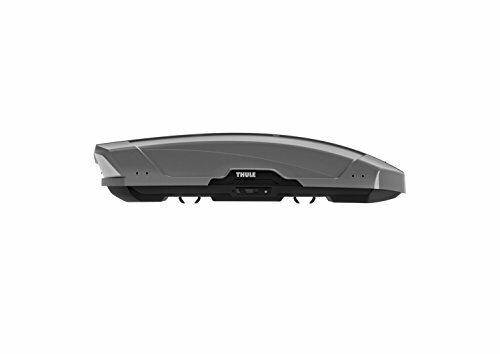 The Thule Force Cargo Box is a hard case rooftop cargo carrier, that’s built for a more long-term solution. This is marketed more towards consumers who like to travel a lot on the road and is looking for a more long-term solution. It boasts an Aeroskin surface that is designed for maximum aerodynamics to cut through air, making it more useful than soft cargo carriers when it comes to driving at higher speeds or windy weather on the road. As far as saving gas is concern, we would rate it as really good and is one of it’s best feature over all. The diamond-textured surface gives it an added durability. It only comes in black, so not much option there. It is positioned a little higher so keep in mind the clearance you need when entering a parking space garage with low ceilings. It features a dual-side opening system that allows you to load or unload from either side of the vehicle, for easy access to your cargo. Another nifty feature of this hard cargo carrier is the Quick grip mount system which allows you to attach the carrier onto your car roof rack without the need of any kind of tools. Allowing you to fully install it in just a few minutes. This product can be slightly heavy depending on your strength so do install carefully. This hard case cargo carrier features an over sized secure lock that makes the use and handling of the carrier a lot easier. Making it a blend of style, design and convenience, that offers a good amount of space, a large interior capacity and overall great value, while still offering those key convenience that's important to users. Since it is a hard type cargo carrier, it no longer comes with straps and buckles. The noise is a lot more minimal compared to soft type cargo carriers. However, the vibrations may produce some pretty annoying noise if not secured properly, so make sure you tighten everything down before hitting the road. The AeroSkin Shell is constructed with five layers of durable market grade ABS plastic. The installation of the Thule Force Cargo box is super easy. You’ll be done in just under 10 minutes. Carrier has a bit of weight to it, you might encounter some problems locking it on your own from time to time. Ideally, you may need more than one person to install or disassemble this. The design does look a little weird. It makes you look like some kind of military scientist from NASA or Area 51 due to the fact that It looks like a capsule or a pod for housing alien life form, and may look awkward on most vehicles. Nonetheless, the Cargo Box held its own against all types of weather conditions. Keeping everything safe and dry, even under heavy thunderstorms. So, if you need a more permanent solution for all your road travelling needs. 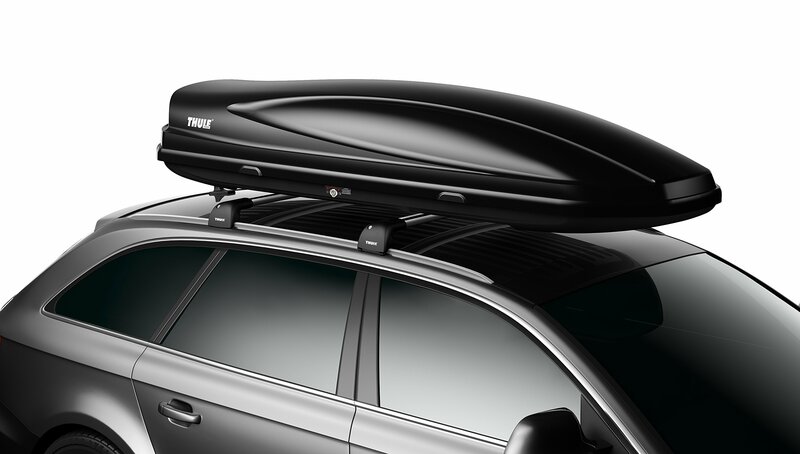 The Thule Force Cargo Box might just be the one for you. The Yakima Skybox Carbonite Cargo Box is another hard type rooftop cargo carrier. The product is made from 80% recycled Carbonite material making it extremely light weight compared to other similar hard type rooftop cargo carriers on the market. Because of its extra lightweight construction, you can install this on your own with ease. It has a clamp on the system that's almost familiar with the previous product, for quick installation and removal without the need of any tools. Just prop it on top of your vehicle roof rack and clamp it in place. But make sure to secure it properly as it tends to be very noisy once it starts to vibrate, so tighten as much as possible. The aerodynamic design allows you to cut through the wind with ease, particularly useful during strong winds or high-speed driving. The product features internal lid stiffeners that securely keeps the lid in place when it's closed, preventing it from flopping around. It also opens from both sides for easy access and closes securely with a super latch and allows you to secure the lid with its integrated SKS locking system. A fancy word that basically does the same thing, locking your carrier. A unique feature of this product is having slidable tracks that give you the versatility to reposition the cargo as close or as far back from the front of your vehicle. This is a really great feature as some cargo carriers that are positioned way far back tend to hit the car’s rear doors or antenna. With the slidable tracks, these problems are no longer an issue. A thoughtful feature indeed. For security, it’s pretty sturdy. Though in general we never advise you to leave your belongings on your cargo carrier, as any serious thief would always find a way to break that thing open. All he needs is a crowbar and a bit of elbow grease and that thing will pop open, but it is indeed sturdier than most cargo carriers out there. It will give any thief quite an effort to steal your cargo, and enough time to trigger your vehicles alarm system. Leaving you plenty of time to prevent any burglary from happening. It is indeed waterproof as you would expect from most hard type cargo carriers out there, so no more worries when it comes to your belongings inside from getting wet. They will stay dry in the pouring rain as long as you make sure that the lid is properly closed. Another great feature is that the key would not allow itself to be detached from the lock until the carrier is closed securely, making sure that you know when it's properly secured. The entire design of this Cargo Carrier is really great. The dimpled design looks really sharp and slick. It is the least awkward looking hard type rooftop cargo carrier out there. The low design is also a great feature as it allows you to get your ride inside most parking garages without hitting the ceiling. With that we strongly recommend this rooftop carrier. This is the last hard type rooftop cargo carrier to make the list. This rooftop carrier has a few useful features up its sleeve. The product has a secure side lock system that houses a separate locking system from both sides. The Thule Motion XT has a functional auto lock feature by indicating when the box is securely closed or not. When you lock the box improperly, it will not allow the key to be removed from the lock. Similar to the Yakima Skybox Carbonite Cargo Box. The item is made from genuine fiberglass that makes it very durable and lightweight at the same time. Having been made from fiberglass makes this cargo carrier fairly scratch proof as well. The product may not have a sliding feature like the previous one, however, this is thoughtfully designed in a way that it is slightly leaning more towards the front to ensure that it does not hit your car’s rear doors or antenna. This cargo carrier is slightly similar in height as the previously feature Thule Force Cargo Box, so keep in mind when it comes to ceiling clearance when entering parking garages. The aerodynamics is pretty good, and the noise is minimal. If you still find that annoying, you can always open the radio to drown out the noise. The waterproof design does its job well, keeping all your cargo dry in any weather conditions. Security is also a great feature. It is sturdy enough to give any serious thief a serious time when trying to pry this open. Enough to trigger your vehicle alarm and alert the neighbors. Opening the lid is a breeze with its Grip friendly handles with a supporting lid lifter that's comfortable to hold. The installation is also very simple. The fact that this is made with fiberglass makes it very lightweight. The mounting is made even more simple, by featuring a Quick mount power click system that's extra wide compared to other mounting features of other carriers. 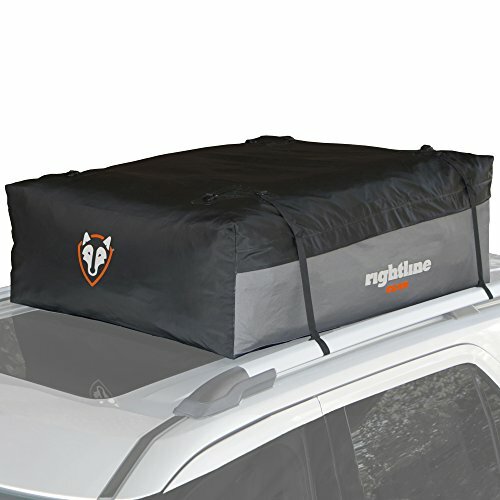 This is great as it keeps the cargo carrier sturdy and secure on your vehicle's roof rack. Another great feature of this Rooftop cargo carrier is that it doesn't just come with one single color. Not two. But three different colors to choose from. From Glossy black, glossy silver and an alpine white. Making sure that yours stand out from the rest of the sea of similar looking cargo carriers out there. Speaking of the design, it looks a bit futuristic, which would look great when it comes to any modern car vehicle. When using a soft type cargo carrier, and you don’t have much cargo to put in. Buy some foam pads instead to make sure that it is full and prevent it from flapping around too much during strong winds or high-speed driving. You may also place a foam pad below to give it some structure. You may also use cardboard boxes to keep everything sturdy. But make sure to never use a cargo carrier below 80% capacity. Most of the times yes, some sort of padding between your vehicle’s rooftop and the cargo carrier itself is necessary. One of the main reasons that make it essential is that when you do have an older car, the paint might come off due to the massive friction that it produces with the cargo carrier when you’re driving at high speeds or strong winds. That is why it is absolutely essential to have some sort of padding between. Another one to consider is the sliding. Without some padding, the soft cargo carrier tends to slide a lot when you’re driving causing the straps to loosen which tend to produce those annoying noises. When using soft cargo carriers, make sure you have some padding in between like a foam or some sort of yoga mat to keep everything sturdy and in place. If you’re trying to use a hard type cover, then you have no choice but to install a roof rack. However, there are other options if you don’t want to spend money on a roof rack. That’s where soft cargo carriers come in. Soft cargo carriers can be installed without the need for roof racks. Simply use the straps to go through your vehicle’s door frame and by using another extra strap to strap and tighten the two opposite straps together through your vehicle door frame. Some soft cargo carriers have clamps that can latch on to your vehicle door frame directly. However, this may not be ideal when traveling at high speeds that go over 70 mph. If you ever experienced those annoying noises from your rooftop carrier, chances are that they are not tightly secured. For soft type cargo carriers, you may need to re-secure the straps every few often to make sure everything is steady and tight. Make sure that the end straps are wrapped properly or tape it on if you have to. Another neat trick that you can do is to twist the strap creating this funnel type strap rather than a flat one, which is more aerodynamic in shape. If doing this still does not solve your problem, you could always open the radio to drown out the noise. For cleaning hard type cargo carriers, simply wash it off with water. However, we do not recommend getting through a car wash with your hard type cargo carriers. Car washes tend to have extreme water pressures that may damage the hardest type cargo carriers. So, stick to manual cleaning. For cleaning soft cargo carriers, on the other hand, we recommend keeping your luggage inside. It makes the cleaning process a lot easier when the cargo bag is full. Since its waterproof anyway. There is no need to worry. The most common question when it comes to choosing a rooftop cargo carrier is that which one should you get, the soft type carrier or the hard one? In this case, both carriers are actually the same with one single difference, and that is longevity. Both carriers are built to withstand most weather conditions, however, one does not last as long as the other. Soft type carriers are designed for the average travelers, who at least ttravel2 – 4 times a year. If you’re that type of person, then we highly recommend getting a soft type instead. It saves you a lot more money that way. For other people who loves to travel a lot, then the obvious choice would be a more long-term solution. A hard type cargo carrier is for you. Finding the right rooftop cargo carrier can sometimes be such a hassle. Specially with the sheer number of similar products out there. Some of which have a lot of useless features for unfair prices. Some of them have features you don’t even need for the type of travel you need. The right quality for the right price, that is what truly matters. Whether you are someone who is simply moving to a new town. Someone who travels occasionally with family or friends. Or someone who loves to go on adventures and see the bigger world, living in the moment. At the end of the day, what really counts is the products ability to hold your cargo well enough and the ability to make sure that everything stays put and stays dry at the end of your long travels. The basics are the most important part. Everything else is just a plus. Choosing the right cargo carrier is like choosing the right interior design for your home. You really have to know your own lifestyle. With that, we hope we have helped you decide which really is the right one for you and find out which is really the best rooftop cargo carriers in the market today for 2018.